URBANA, Ill. – Consumers today insist on all-natural everything, and food dyes are no exception. Even if food manufacturers are willing to make the change, current sources of natural dyes are expensive and hard to come by. Now, a large University of Illinois project is filling the gap with colored corn. “Most natural colors come from things like wine skins, red carrots, and beets. The problem with that is most of the product is wasted in extracting the coloring. It’s not good value,” says Jack Juvik, a geneticist in the crop sciences department at U of I.
Juvik and an interdisciplinary team have been experimenting with purple and blue corn varieties, noting that health-promoting pigments known as anthocyanins are located in the outer layers of the corn kernel. That makes a big difference, economically. “You can process corn in different ways to remove only the outer layer. The rest can still be fed into the corn supply chain to make ethanol or grits or any of the other products corn is already used for. That outer layer becomes a value-added co-product,” Juvik says. The team has covered a lot of bases since the $1.4 million project began in 2014. For example, they identified the optimal milling process and demonstrated that corn-derived anthocyanins remain stable in food products. What’s left is to find the most potent sources of the pigments for future corn breeding. In a recent study, Juvik and his colleagues looked at anthocyanin type and concentration in nearly 400 genetically distinct lines of colored corn. They grew these lines in Illinois to see if anthocyanin concentration stayed constant from generation to generation – a critical quality for breeding new varieties. 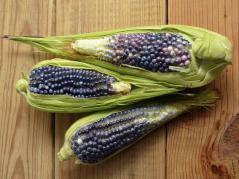 Peruvian types had some of the highest anthocyanin concentrations, and they held up throughout multiple generations. “That’s good news. It means we can select for the trait we’re interested in without worrying whether it will be expressed in new environments,” Juvik says. The next step will be getting those mighty Peruvian genes into high-yielding corn hybrids selected for production in the Midwest. If Juvik is successful, blue or purple corn could come to a field near you. The article, “A survey of anthocyanin composition and concentration in diverse maize germplasm,” is published in the Journal of Agricultural and Food Chemistry. Co-authors Michael Paulsmeyer and Laura Chatham are graduate students and Talon Becker a post-doctoral scholar in the crop sciences department at U of I. Megan West and Leslie West worked for The Kraft Heinz Company, which supported the project. Additional support came from the Illinois Corn Grower’s Association and Monsanto.